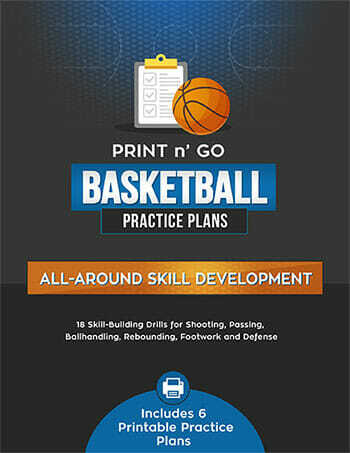 Basketball Practice Plan Spotlight: 3-Time State Championship Coach! Make our athletes TEAM basketball players within a successful program. Function as a family with a goal of becoming better people. Strive to have each and every player within the program know and understand their roles on and off the court. Man-to-man help defense where we front the post. We instill in our players that if you want to get to the highest level you are going to have to guard teams man-to-man. We also focus on over-helping and fronting the post because we believe if we can limit post touches it will help our defense get stops. 1. Force penetration to the baseline: we do this because that is where our help is. 2. Front the post: front the post because we have early help on baseline penetration. 3. Closing out with high hands every time: we do this to get our players in their defensive stance. 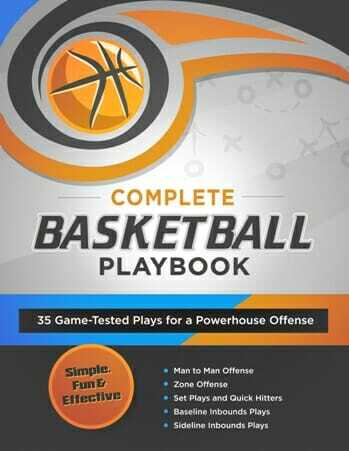 Run a motion style offense with some set plays out of it. We believe when we run set plays it gives our players confidence because they know certain sets are for them. We try to put all of our kids in offensive situations where they can have success. We try to push tempo but if it not there we pull it out and run our sets and try to run the best offense we can. This is a drill my players love. 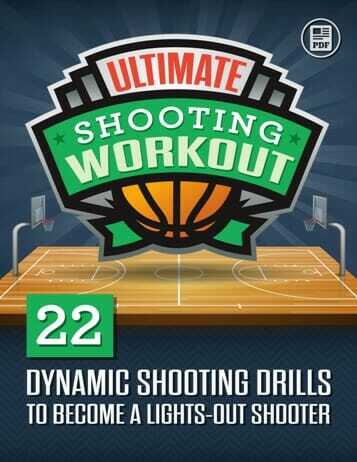 This drill focuses on chinning the basketball on a rebound, v-cuts, outlet passes and finishing with contact. We really focus calling out each others name in this drill to work on communication. Step 1: Each player in the line with number 1 has a basketball. To start the drill the player in line one throws the basketball off the backboard and jumps as high as he can and rebounds it. The player chins the basketball and outlets it to line 2. 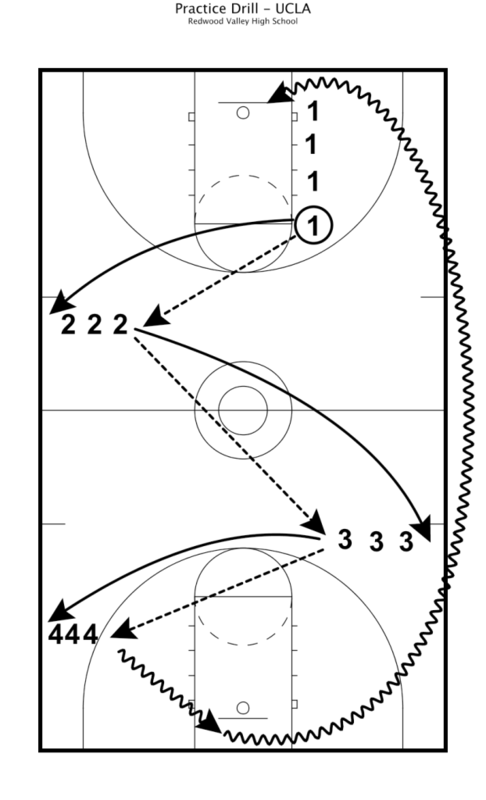 When the player passes the basketball he fills in behind line 2. Step 2: Line 2 receives the ball and passes it to line 3. Before line 3 receives the ball the player must v-cut to come to the ball. When the player passes the ball from line 3 he fills in behind line 3. Step 3: When line 3 receives the ball he passes it to line 4 for a backdoor layup which is also set up by a v-cut. I usually have a coach under the basket with line 4 with a football pad trying to create some contact on the layup. After the player in line 4 finishes the layup he speed dribbles to the other end and throws the basketball off the backboard and the drill starts again. 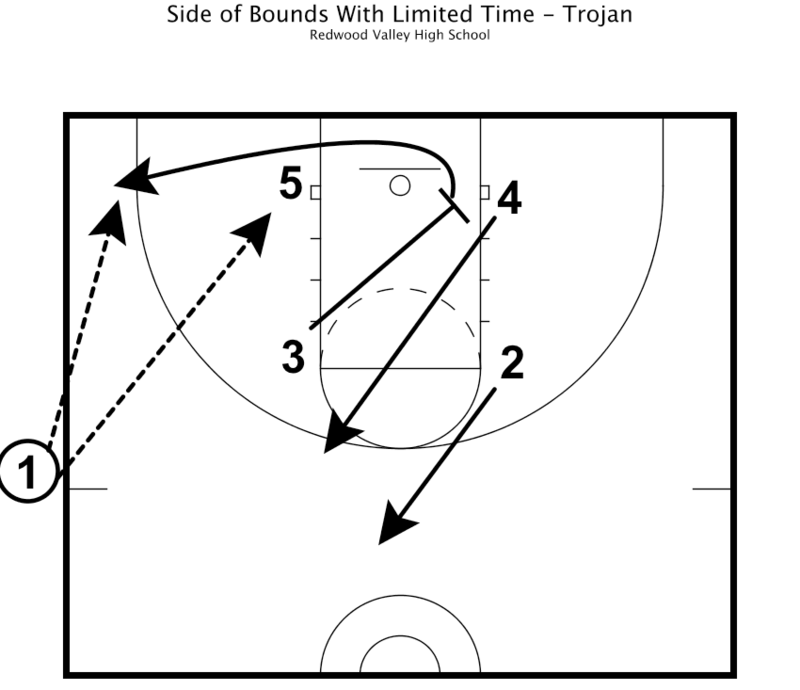 We run this out of bounds play at least three or four times a game because it is hard to stop. It is a great set to get an easy shot. Step 1: We stack four players right in front of the ball starting on the block. Step 2: Player 1 slaps the ball and number 2 breaks to the corner and player 3 breaks opposite number 2. Player 4 steps forward and player 5 breaks straight back. Step 3: Player 1 passes the ball to player 2. Player 2 then passes the ball to player 5. Step 4: Player 1 steps in and curls around a screen that is set by players. Player 5 passes it to player 1 to finish the play. We run this play a few times a game. 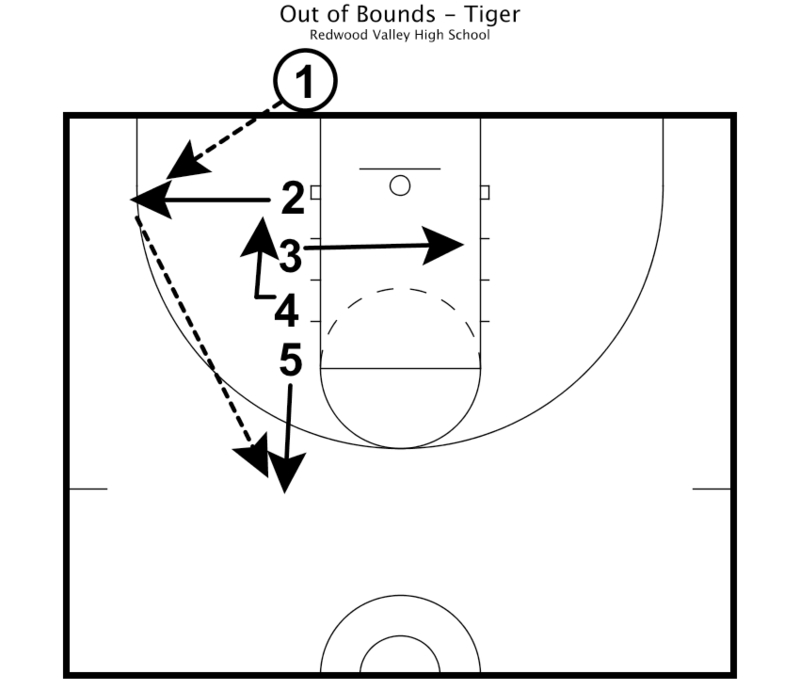 We also run this if we need a last second shot on a side out of bounds play. You can get a 3 out of the set or a post touch. Step 1: Player 1 slaps the ball and player 2 breaks for half court and player 3 sets a diagonal screen for player 4. Player 4 breaks to the ball. Step 2: After player 3 sets the screen for player 4 he breaks to the corner off of a screen set by player 5. Once player 5 sets the screen he seals on the block. We look to get a shot in the corner for player 3 or we look for player 5 in the post. We run this set a few times a game against a man-to-man defense. 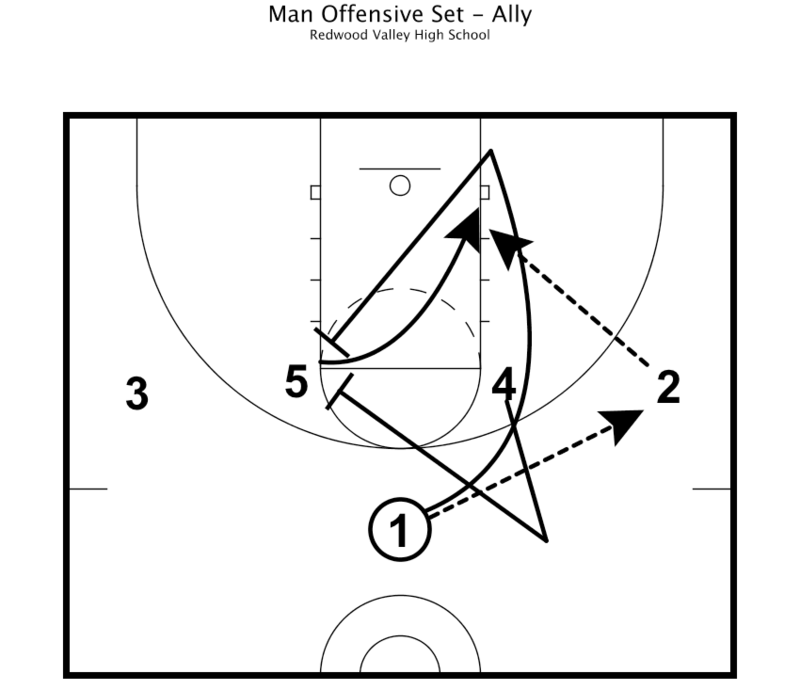 This set looks to isolate a post player and get a 3 point shot for the point guard. Step 1: This set is run out of a 1-4 high set. We run it with the two post players on the elbows and two wings at the free throw line extended. To start the set player 1 throws it to player 2. Step 2: Player 1 runs off an up screen of player 4 and player 2 will give a quick look to player 1. 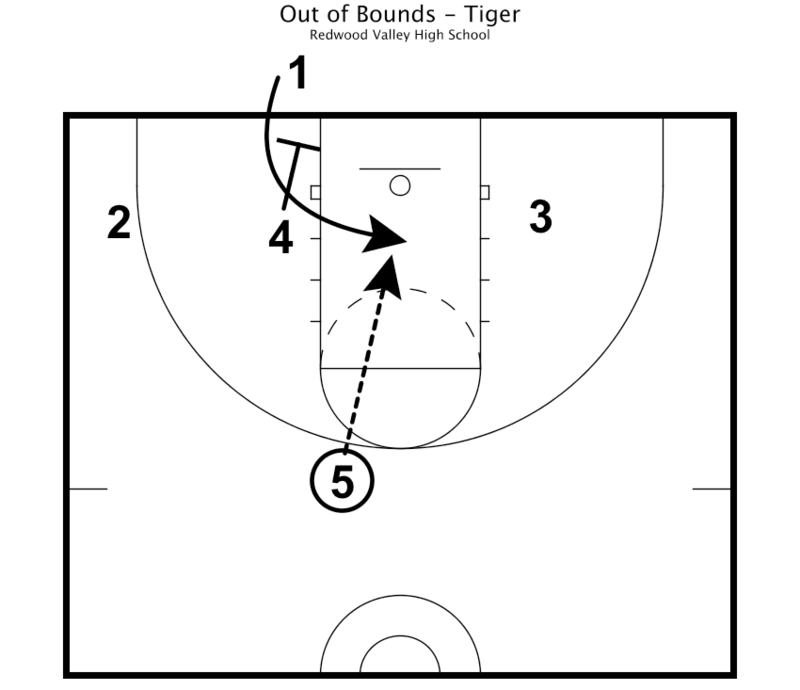 After player 4 sets the up screen he pops beyond the three point line. If player 1 doesn’t get the ball there he curls around and sets a cross screen for player 5. Step 3: Once player 1 sets the screen for player 5 he dives to the block and we look to hit the post. Hitting the post is option number 1. Step 4: Option number 2 is for player 4 to set a pin down screen for player 1 on the elbow opposite the ball. Player 1 comes off the screen from player 4 looking for a three point shot.